Rustic Lavender Wedding Favour – Pegasus Florist - Naturally Dried Lavender in Malaysia! Discount available for bulk quantity! For this item, kindly contact us at pegasusflorist@gmail.com to place your order. We shall advise you accordingly. Thanks! 1. Can I customize the packaging of this favour? Our packaging is one type only (rustic-themed as in photo). 2. Can I design my own “Thank You” sticker? Our “Thank You” sticker is one type only (as shown). However, you are able to customize the sticker by giving us the bride & groom’s name + wedding date. 3. What is consisted in each favour? 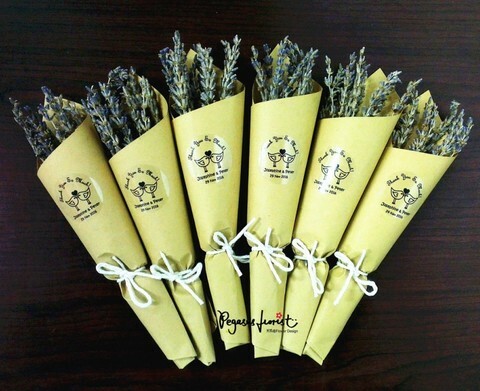 Each favour consists of naturally dried lavender x 10pcs, plus a “Thank You” sticker. 4. What is the minimum order quantity for this favour? Our minimum order quantity (MOQ) for this favour is 50 units. For this item, kindly contact us at pegasusflorist@gmail.com. We shall advise you accordingly. 6. How early shall I place the order? 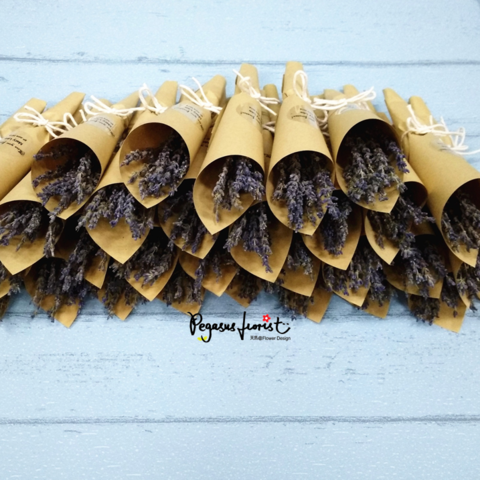 For rustic lavender wedding favour, we recommend you to order from us 3 weeks in advance. Just in case there is a problem during shipping, we will have time to react. This doesn't happen, but with weddings it is better to be safe than sorry. 7. How many days do you need to process my order? Once the payment is made, we will start to prepare your order & ship out within 7 working days. 8. There are drop of lavender buds when I open the box. Is it normal? Due to the characteristic of dried lavender, it is normal to have little drop during the transportation. Rest assured that the wedding favour will be carefully packaged to ensure they reach you in good condition. 9. I can no longer smell the lavender scent on my big day. Why? 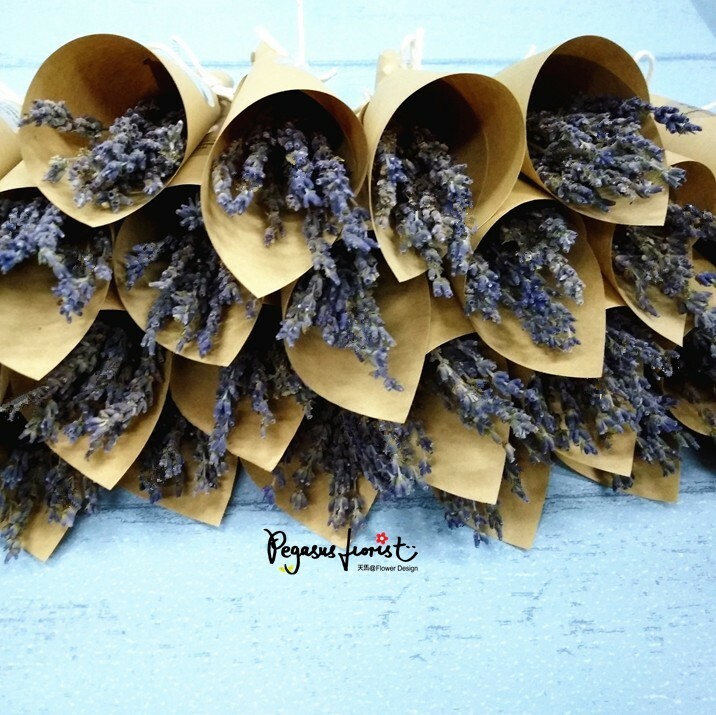 Please bear in mind that our lavender is naturally dried & no artificial fragrance/ colour added. The scent is purely natural and mild, unlike the intense artificial fragrance that may cause discomfort such as dizziness & nausea to certain user. So, for those who ordered earlier, you may not smell them after some time. 10. What should I do then? Gently pinch the buds with your fingers & you will smell the refreshing lavender scent again. 11. Why my fingers feel slightly oily when pinching the lavender buds? 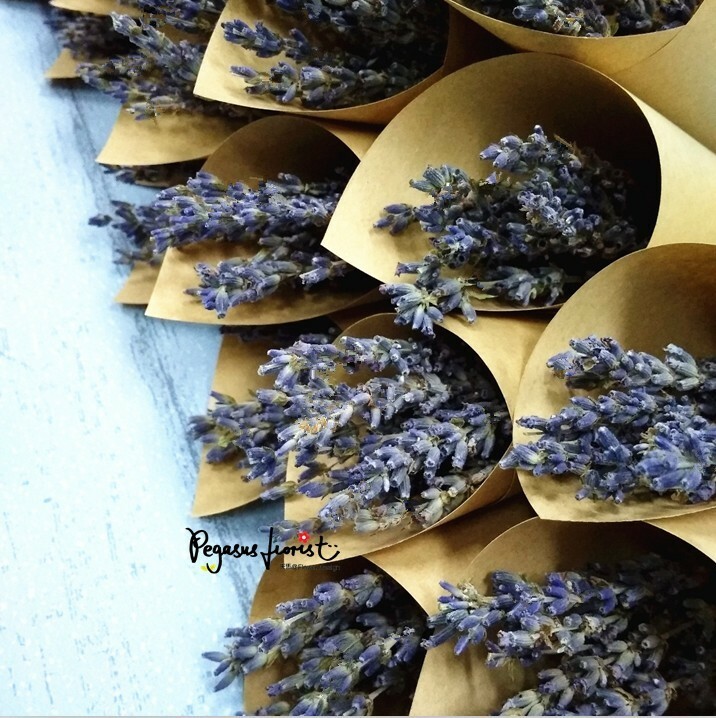 When you pinch the buds, this will release their natural lavender essence oil with refreshing scent. That’s why you may feel slightly oily on your fingers. 12. What else should I pay attention to? Never wet your lavender & keep them in the box until your big day. Always store them in a dry & ventilated place. Please bear in mind that our dried flowers do not undergo chemical treatment to ensure no chemical residues remain. So, please avoid humid area as bugs and mold love a humid home. If you notice any, it's time for you to expose them to sunlight for a while, so that they stay dry all the time. 13. May I know about the shipping & payment method? For shipping, please contact us at pegasusflorist@gmail.com; while for payment method, please click here.